Kevin Harvick started 10th, finished second and collected nine bonus points. The No. 4 Jimmy John’s Ford came to pit road under caution on lap 30 for four tires and an air pressure adjustment. Harvick restarted fifth on lap 32 and raced his way to second by the end of the stage. At the end of Stage 1, Harvick came to pit road for four tires, fuel and a small adjustment. Harvick started second and finished seventh, collecting four bonus points. The Bakersfield, California, native came to pit road under caution on lap 123 for four tires, fuel and an air pressure adjustment to correct a loose-handling condition. The No. 4 Ford restarted sixth on lap 126 and raced up to the third position before a caution flag flew on lap 146. Harvick came to pit road under caution on lap 127 for four tires and fuel, while a handful of cars stayed out to gain stage points. The 2014 Cup Series champion raced from the eighth position up to seventh in a one-lap dash to the end of the second stage. Harvick raced to the lead on lap 178. On lap 194, Harvick surrendered the lead under caution to visit pit road for four tires, fuel and a small adjustment. He came off pit road fourth after the top-two cars opted for a two-tire pit stop. Harvick was running in the second position on lap 247 after an extended three-car battle with the No. 11 and No. 18 for the lead. Harvick took the lead when the pit stop cycle worked its way out and led the final 22 laps. Harvick’s victory in the TicketGuardian 500k marked the 46th overall win for Stewart-Haas Racing (SHR). It was the organization’s 42nd points-paying Monster Energy NASCAR Cup Series win and its sixth at Phoenix. This was Harvick’s 40th career Cup Series win. It puts him in a tie with NASCAR Hall of Famer Mark Martin for 18th on the all-time NASCAR Cup Series win list. This was Harvick’s 17th Cup Series victory since joining SHR in 2014. Harvick is only the ninth driver to earn nine or more wins at a single track. The only other active driver to accomplish this feat is Jimmie Johnson, who has nine wins at Martinsville (Va.) Speedway and 11 wins at Dover (Del.) International Speedway. 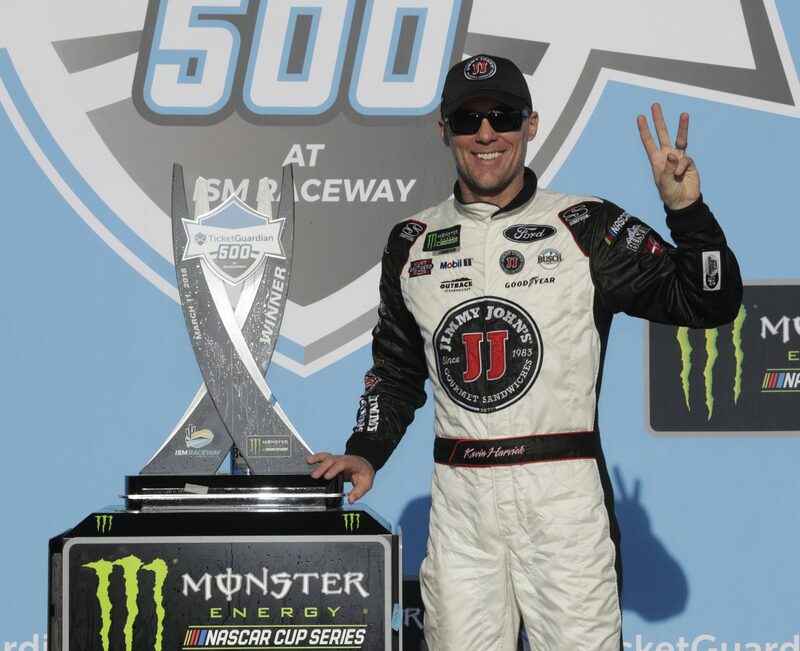 Harvick’s run of three straight wins marks only the 24th time in NASCAR’s modern era (1972 to present) where a driver has won three consecutive races. Nine of the 23 previous times a driver has won three straight races in a season, that driver has gone on to win the championship. Kyle Busch was the most recent, as he won three in a row and the championship in 2015. Harvick led twice for 38 laps to bring his laps-led total at Phoenix to a series-best 1,522. Harvick finished second in Stage 1 to earn nine bonus points. He finished seventh in Stage 2 to earn an additional four bonus points.